Yesterday was the start of the 5 week long free food giveaway from the “Taste of Korea” food truck. Their 1st stop was at Bryant Park and lucky for me I happened to be having lunch at Bryant Park yesterday. Luckily I spotted them early enough, because even though their Facebook page says they would be serving up freebies until 2pm, they closed the line around 1:15 yesterday. 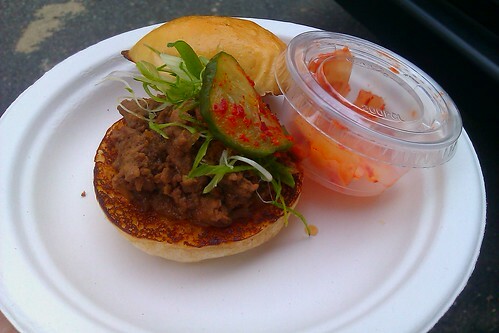 After 20mins of standing in line I was handed a very nice looking bulgogi filet mignon silder with a side of kimchi. Finely sliced tasty warm filet mignon, buns toasted in butter, and the freshness and texture from the scallions and the slice of cucumber made a really good slider. Today the truck will be at 52nd & 6th serving Danji’s spicy pork belly (the Serious Eats crew are fans of their spicy pork belly slider). Make sure to check their Facebook page or the ML Twitter Tracker for the truck’s schedule. Posted by Donny T. at 9:30 am, April 19th, 2011 under Deals, Free Stuff, Korean. Nope. Though I was there when this actress cut right in front of me and I had to wait for her to finish to pretend to eat and liked the food while people were snapping her photos. I found out later she’s the mom from Gossip Girl. *shrugs I just wanted my free slider and leave. I got it for your mom too!